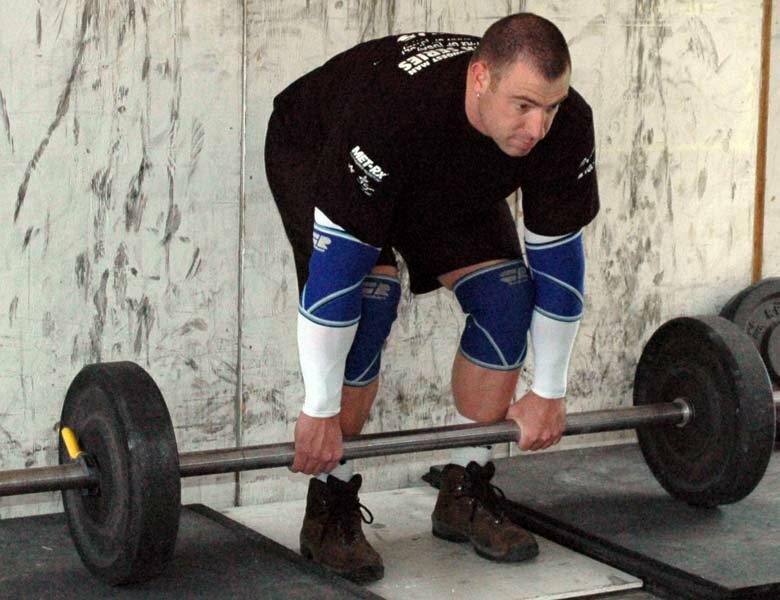 What Is The Best Strongman Workout? What is the best strongman workout? 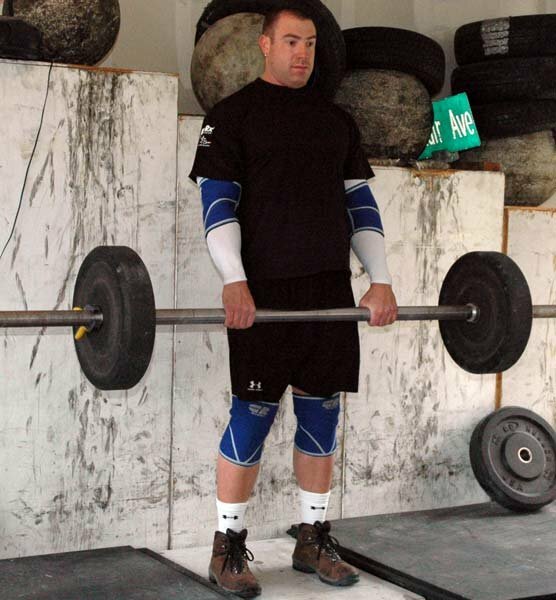 Our forum members share combined training workouts, tips, exercises, and more on what they think is the best training for strongmen! Learn more right here! TOPIC: What Is The Best Strongman Workout? The strongman competition is physically demanding to the extreme. It requires years of hard work. In order to perform the heavy and awkward tasks, one needs a solid workout routine. What is the best strongman workout? Be specific. Is this type of workout more or less dangerous than that of a bodybuilder? How so? 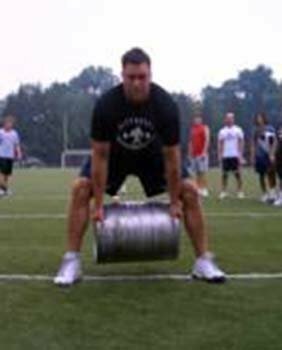 Would you recommend this workout to anyone besides strongman competitors? 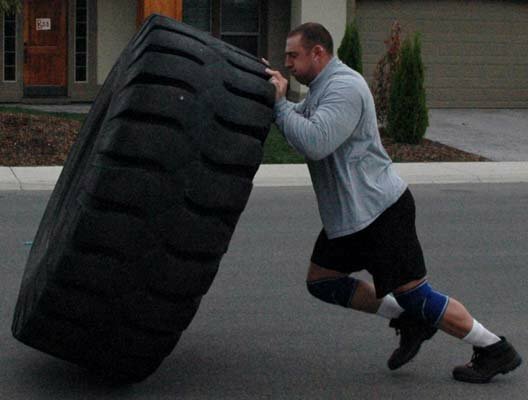 Strongman competitors are the strongest men on the planet. They train a little bit differently from bodybuilders and powerlifters using many special tools to improve their strength such as atlas stones and the axle. They still use some of the principles in bodybuilder and powerlifter workouts such as the maximal effort, dynamic effort, and repeated effort. Strongman train to use their muscles and be able to lift heavy weights, not to look pretty. During a cycle for an upcoming competition they train for the certain events in the competition and learn the coordination for the events. While still keeping the basic lifts in (bench, squat, and deadlift) they will cycle in a strongman exercise or event. I prefer to use the conjugate method to structure the workouts. The conjugate method consists of three methods called the maximal, dynamic, and repeated effort. [ Click here to learn more. ] Maximum Effort: Break On Through To The Other Side. The Max Effort workout. 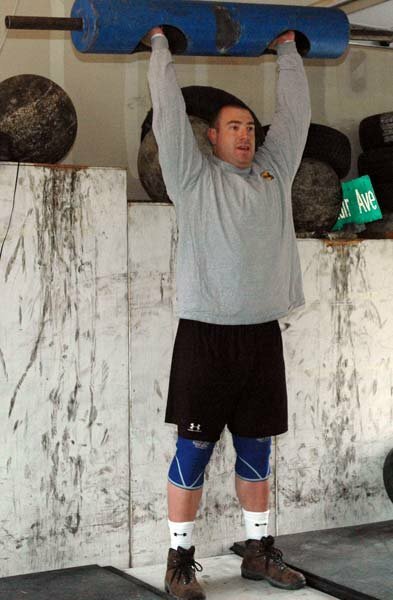 This workout focuses on gaining strength and preparing for strongman competitions. Both exercises and the weight (intensity, volume) must change over time. You want to adapt to a new stimulus, which is what makes you progress stronger and bigger. The training workouts must be specific to the athlete. Everyone is different, not gaining on a certain exercise? Dump it for another exercise and see how well it improves over time. Don&apos;t over do this though, change only the things that are necessary. You also want to make sure that your nutrition is clean and enough to gain weight (which should be your main goal). I recommend eating 1.5-2 grams of protein per day, carbs after exercise but kept fairly low (depends how tolerant you are), and high healthy fats. 1. Eat Every 2-3 Hours - No Matter What. Are you doing this - no matter what? Now, you don&apos;t need to eat a full meal every 2-3 hours but you do need to eat 6-8 meals and snacks that conform to the other rules below. To make it easier on you, we&apos;ve provided 100 meals that you can use daily to improve your feeding frequency. 2. Ingest Complete, Lean Protein Each Time You Eat. Are you eating something that is an animal or comes from an animal - every time you feed yourself? If not, make the change. Note: If you&apos;re a vegetarian, this rule still applies - we&apos;ll discuss your needs later in the Protein A Plenty section of the book. To help you understand how to do this, all of the meals in this book contain a good portion of complete, lean protein. 3. Ingest Vegetables Every Time You Eat. That&apos;s right, every time you eat (every 2-3 hours, right), in addition to a complete, lean protein source, you need to eat some vegetables. You can toss in a piece of fruit here and there as well. But don&apos;t skip the veggies. To show you that eating veggies isn&apos;t the frightening proposition it used to be, most of the meals contained in this book use veggies in their preparation and actually make them taste good! If want to eat a carbohydrate that&apos;s not a fruit or a vegetable (this includes things like things rice, pasta, potatoes, quinoa, etc. ), you can - but you&apos;ll need to save it until after you&apos;ve exercised. [...] To stop heading down the [bad health] highway, reward yourself for a good workout with a good carbohydrate meal right after (your body best tolerates these carbohydrates after exercise). For the rest of the day, eat your lean protein and a delicious selection of fruits and veggies. To make this rule easy on you we&apos;ve labeled the meals in this book as PW (good post-workout meal; to be eaten within a few hours after exercising) and Anytime (good meals for any other time of the day). 5. A Good Percentage Of Your Diet (25-35%) Must Come From Fat. Just be sure it&apos;s the right kind. There are 3 types of fat - saturated, monounsaturated, and polyunsaturated. Eating all three kinds in a healthy balance can dramatically improve your health and even help you lose fat. Your saturated fat should come from your animal products and you can even toss in some butter or coconut oil for cooking. Your monounsaturated fat should come from mixed nuts, olives, and olive oil. And your polyunsaturated fat should from flaxseed oil, fish oil, and mixed nuts. 6. Ditch The Calorie Containing Drinks (Including Fruit Juice). In fact, all of your drinks should come from non-calorie containing beverages. Fruit juice, alcoholic drinks, and sodas - these are all to be removed from your daily fare. Your absolute best choices are water and green tea. Most of your dietary intake should come from whole foods. There are a few times when supplement drinks and shakes are useful (we&apos;ll discuss them later in the book). But most of the time, you&apos;ll do best with whole, largely unprocessed foods. I know you cringed at a few of the rules above - perhaps #6 in particular. But here&apos;s a bit of a reprieve. 10% foods are foods that don&apos;t necessarily follow the rules above - but foods you&apos;re still allowed to eat (or drink) 10% of the time. 100% nutritional discipline is never required for optimal progress. The difference, in results, between 90% adherence to your nutrition program and 100% adherence is negligible. Just make sure you do the math and determine what 10% of the time really means. For example, if you&apos;re eating 6 meals per day for 7 days of the week - that&apos;s 42 meals. 10% of 42 is about 4. Therefore you&apos;re allowed to "break the rules"? 4 meals each week. The hardest part about eating well is making sure you can follow the 8 rules above consistently. Let&apos;s face it; during the week when you&apos;re busy you&apos;re not going to be spending a ton of time whipping up gourmet meals. During these times you&apos;re going to need a set of tasty, easy to make foods that you can eat day in and day out. However, once every day or a few times a week - you need to eat something different - something unique. In your training cycle you will want to add in events specific to what you will be doing in the contest. 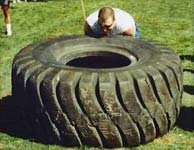 As an example for the workout, we&apos;ll say the contest has log lift, sled dragging, atlas stones, tire flip, and farmers walk as the events. We&apos;ll structure the training around a two-week rotation. Sled drag 4 trips 20 yd. 15 yd. sprints 10 sets full recovery 60 sec. Like any other routines out there, you still have the risk of injury. You can reduce this by using proper form and not wasting yourself away going to failure. 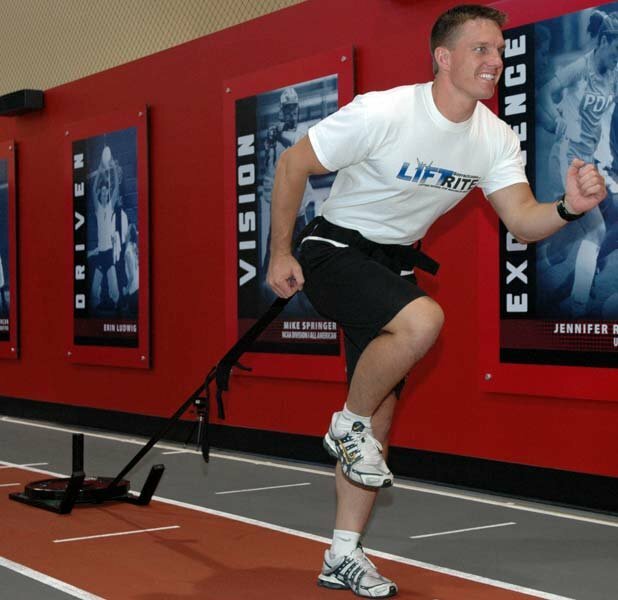 With the tools you&apos;re using in the workout risk of injury is slightly increased. Make sure you start off light and learn the form before adding weights. The problem with bodybuilder routines are muscle imbalances. This can be corrected by using uni-lateral movements and working on weak points. I would say that the risk is slightly increased because of the equipment you use such as a tire can fall on you if you lose your balance. Remember to always have a training partner with you and to use the correct form. Do These Guys Look Small Or Weak? Cycling in events into your training cycle is a good idea. They are fun challenging and overall produce results. It has benefits for bodybuilders to get away from their normal training and to challenge themselves in a different manner. It can also help powerlifters increasing their lifts. And sports athletes can also use these to their advantage. Strongman training, possibly the most demanding form of strength training out there. Not only does it take years to be at the level that these people are, but it takes intensive training. 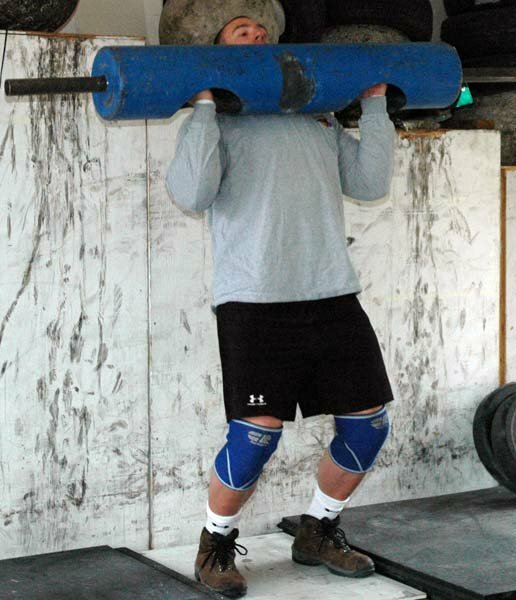 Strongman workouts are geared towards pure strength and explosiveness. To achieve this, you need to have strength throughout every part of your body, but also have the ability to have them all function together while exerting maximum force. As with all forms of lifting, form is key to everything; the largest factor in safety, results, and strength with strongman training. Since you can&apos;t just go out and perform strongman workouts every day, its good to set up in a 3 day system where you would train on 3-4 days. For the example below, we will use an example 3-Day training schedule. 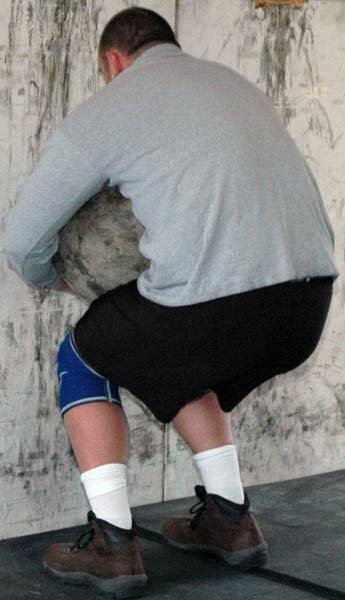 This is extremely important with strongman training. Your body is using many muscles each going through a large range of motion, so for best results, and safety, it is highly recommended that you properly warm-up with dynamic stretching. [ Click here to learn more. ] Stretching And The Warm Up! "Zigzag" Farmers Walk: Perform 3 sets of 50 yards around cones. Rest 3-4 minutes between sets. Remember, to WALK through this, and not force yourself to run. 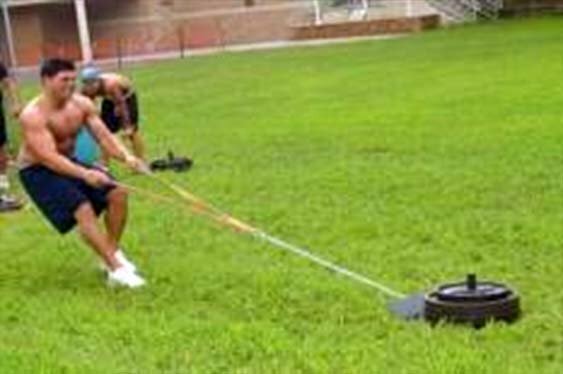 Backward Sled Drag: 2 sets of 40-50 yards. Rest one minute between sets. This is a great "finisher!" Tug-of-War: The tug-of-war separates the men from the boys. By the end of this workout, most guys are exhausted. Perform a two-out-of-three or three-out-of-five series to finish your workout. We rest one minute between each "war." This session will help train your muscles to work together and allow you to continue to use weights while improving your range of motion. ***Days not mentioned are recommended off days. As strongman training can be very taxing on your body, it is ideal that you eat LOTS and get plenty of rest. 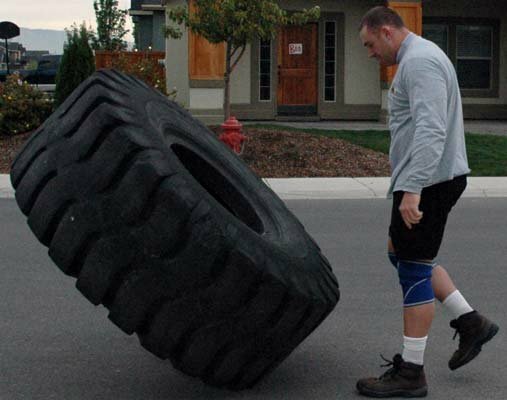 Strongman training is a very dangerous form of training and does surpass that of bodybuilding. Because of the range of motion that you are making and the large amounts of weight you are moving your body be at greater risk of injury. This is why it is stressed that you train all your muscles together and avoid isolation exercises, as they can leave some muscles weaker than others that would result in injury. 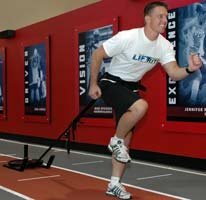 It&apos;s simple, if someone has a lower body that&apos;s strength is far out of balance with the upper body, it is easy for injury to occur as one muscle group may give out or not be able to handle the pressure in the same manner. 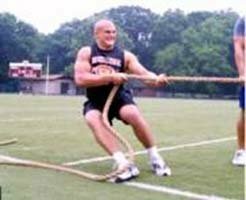 An extra note for safety with strongman training, actually any training for that matter is ALWAYS, and I stress this to everyone I know, ALWAYS warm-up before training, do dynamic stretching, and NEVER static stretch before a workout. Also, always lift with a buddy, lifting alone is dangerous and without a proper spot, it can get ugly. [ Click here to learn more. ] How To Be The Best Spotter In The Gym! There&apos;s more to spotting than simply pulling up on the bar or pushing up on the elbows. There is an art and science to effective spotting. For somebody simply looking to get cut and look good, this is most likely not for you. 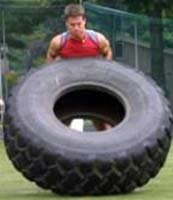 Strongman training is exactly that, training to be strong, not to look good. Anyone looking for strength, explosiveness, and a new workout, this is a great thing to tryout. Especially athletes. 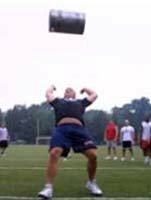 Athletes of contact sports like rugby and football always want to be tanks and more dominant on the field, this kind of training will make you exactly that as you get stronger, more explosive, and the machine you want to be. Strongman competitions are solid end goals for pure powerlifters. These competitions focus purely on the strength of the competitor and nothing else. Even the most elite competitors seen on ESPN most nights around 2 am are far from physique champions. I think it&apos;s safe to say that even the top tier strongman competitor would have trouble placing in even the most irrelevant small town bodybuilding competition. Then again, that&apos;s not what these guys are about. For a bodybuilder, it&apos;s never about how much you can lift, but how much it looks like you can lift. A strongman is the exact opposite end of the spectrum. They may look like ogres, but they can sure move the weight. Which brings us to the question at hand, how do you get yourself in shape to move that kind of weight? In formulating a workout in preparation of a strongman competition, you are looking to formulate incredible bursts of maximum strength for very specific tasks. The key word in that sentence is bursts. Taking a look at many of the tasks involved in a strongman competition, the vast majority of them are basically continuous 1 rep sets. For instance, when placing boulders on a pedestal one after another, you are basically doing a rep, resting while moving to the next one, and repeating. These &apos;bursts&apos; of energy really put a focus on fast twitch muscle fibers. Of course the endurance of the events require some use of slow twitch fibers, but the duration is generally such that they are not nearly as important as the fast twitch fibers. With that being said, about 80% of your workouts should concentrate on fast twitch fibers, and when it comes to training the "burst" fibers, nothing beats heavy compound movement exercises with low repetitions. Due to the intensity of these workouts, a great deal of recovery time if also needed to insure that the muscles have adequate time for recovery and the competitor does not venture into the perils of overtraining. Therefore, a 2 day in 4 training sequence is recommended with the 2 working days being split primarily between upper body and lower body with heavy weights (as heavy as you can complete), somewhat high sets, and low repetitions with 2-3 minutes rest between each set. [ Click here to learn more. ] Don&apos;t Let Overtraining Stop You! Of course the upper/lower body splits are not entirely feasible due to the compound motions of many of these exercises. Also, some time should be spent in the course of each workout actually practicing strongman type events. Due to the awkwardness of some of the events in a strongman competition, actually practicing them is imperative to a good showing. Bench Press 5 sets of 4-5 reps. Hang and Clean: 5 Sets of 4-5 reps.
Deadlifts: 5 Sets of 4-5 reps.
Military Press: 5 Sets of 4-5 reps.